"The Valentino show blew my mind. 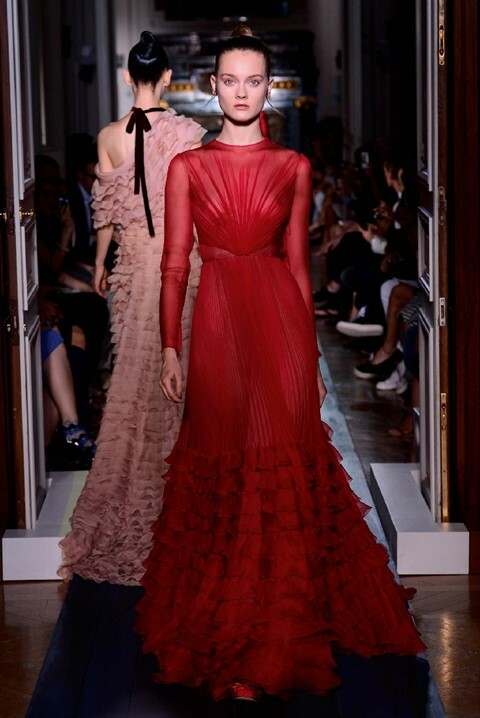 It was so couture but in the best possible way, one of those shows you had to be at, the movement of the garments made them special – structured and graphic they had a very soft movement and all the girls looked incredible. It was the sort of show you look at and think 'I would love to be a couture buyer', you'd be spoilt for choice. Normally it is such an abstract thought: you spend days looking at clothes as art as you know you wouldn't be able to wear in your wildest dreams. But at Valentino I found myself thinking 'I would love to be in the position to buy and wear this', or go to an event where you could borrow and wear legitimately. Every single piece here would make you feel incredible. But in a very cool way, not just a princess fairtytale. Some of the shapes had a real influence from Irish cosutmes, with their embroidery and form. The flowing silk dresses were very impressive as well. Plus the shoes that were like a ballet pump but with a heel. The concept of couture is so extravagant today, especially when you think of politics and economics at the moment. But the world needs a bit of sparkle and done well it gives us purpose, keeps us dreaming and is something to look optimistically to. Especially with Dior's new incarnation under Raf Simons. It really is the beginning of a new era."